A short biography of Luis Andres Edo, one of the last historic figures of the Spanish anarchist organisations CNT-FAI. I had the privilege of meeting many outstanding anarchists of both the French and the Spanish movement whilst living in Paris in the early 1970s. One of those that I encountered was the tough Spanish worker, Luis Andres Edo. He was then making a living working on building sites, spending his spare time in activity against the Franco regime. He was one of the last historic figures of the Spanish anarchosyndicalist union, the Confederacion Nacional del Trabajo (National Confederation of Labour - CNT) and he took part in the actions of the militant anti-Franco First of May Group in the 1960s and 1970s. He was born the son of a Guardia Civil (military police officer) on 7th November 1925 at the barracks at Caspe but at the age of eleven months was moved with his family to Barcelona where experienced the Francoist bombings of the city. He started work on the railways at the age of thirteen. His reading and then his involvement in underground union work led him to the anarchist movement and membership of the CNT at the age of seventeen. He took part in the first student strikes in Barcelona under the dictatorship. After three months of conscripted military service, he deserted and fled to France. He then carried out several missions inside Spain but was arrested in 1952 and interned in a military prison until October 1953. Sent once more into the army, he deserted again and ended up with six months of solitary confinement. It was during these years that he developed his organisational capacities, both inside and outside prison. He was active within the Coordinadora de Presos en Lucha - Coordination of Prisoners in Struggle (COPEL). He then escaped to France, and was by now already being seen as one of the charismatic figures of Spanish anarchism. He joined the Libertarian Youth (FIJL) and from 1961 the Federacion Anarquista Iberica (Iberian Anarchist Federation - FAI). He was made responsible for several posts within the movement, including supervising the propaganda work of the CNT’s National Committee. At the reunification congress of the CNT in 1961 he joined the Defensa Interior, a group set up to engage in action against the Franco regime. In 1966, he was arrested in Madrid for complicity in the kidnapping of the Papal Nuncio Mgr Ussia in Rome and by 1972 had passed through the prisons of Carabanchel, Soria and Segovia, which he described in his book La Corriente, published in 2002. There he participated in several hunger strikes and was often put in solitary. Between 1972 and 1974 he was in París, where he worked with other anarchists, working on building sites to earn a living. On his return to Spain he was again arrested on the 1st May 1974, accused of collaboration with the Internationalist Groups of Revolutionary Action (GARI) and of having taken part in a press conference in Madrid claiming the kidnapping of the Spanish banker Suarez in Paris. He was sentenced to five years and once again took part in hunger strikes which earned him 120 days in solitary. He was released with the amnesty of 1976. With the refounding of the CNT in Catalonia after Franco's death on the 29th February 1976, he became a member of its Regional Committee acting as General Secretary and as director of the CNT paper Solidaridad Obrera. He took part in the huge meeting at San Sebastian de los Reyes in 1977 which celebrated the re-emergence of the CNT and which attracted more than twenty thousand people. He was an organiser of the Libertarian Days in Barcelona the same year which drew an audience of over a thousand. In 1980, he was again imprisoned for a month. 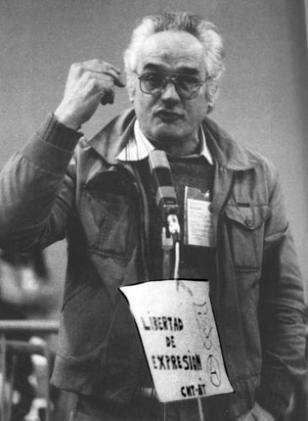 He wrote for many anarchist papers like Catalunya (1977), Cnt, Construccion (Barcelona, 1979-80), Historia Libertaria, Lletra A, Nada, Solidaridad Obrera, Presencia, Tinta Negra, etc. and was the author of the book La CNT en la encrucijada: aventuras de un heterodoxo (The CNT at the crossroads: adventures of an unorthodox) published in 2006. He died on 17th February 2009 after heart and lung problems. Him and Casas Gomez were two important figures in the transition from underground to above ground CNT emergence.